The Washington Metropolitan Area Transit Authority (WMATA) provides bus and rail transit service to Washington, DC and the Maryland and Virginia suburbs. Metrobus operates 24-hours-a-day, 7 days a week with approximately 1,500 buses. Service intervals vary by time of day and by weekday/weekend to meet demand. 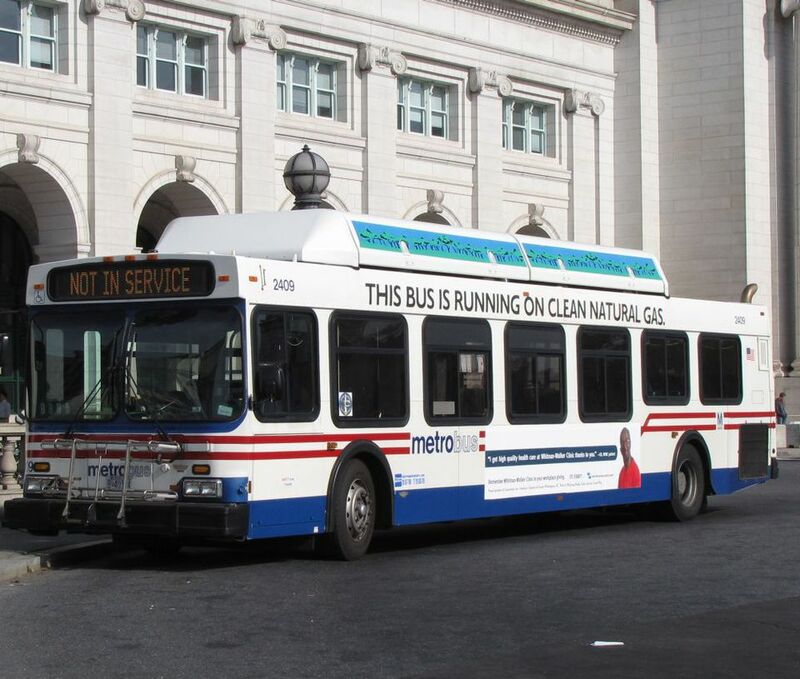 Metrobus stops are designated with red, white, and blue signs and the route number and destination are displayed above the windshield and on the boarding side of the bus. Exact change is required. Bus drivers do not carry money. Weekly passes are available for unlimited travel on Metrobus. Children's fares: Up to two children, 4 years and younger, ride free with each adult paying full fare. Children 5 and older pay adult fares. Discounted farecards and passes are available for DC residents. Maryland students ride free on Metrobus and Ride On buses when boarding in Montgomery or Prince George's counties between 2 and 7 p.m., Monday - Friday. Students must show either a school ID or a student bus pass signed by their school principal. For more information about purchasing a SmarTrip® card, call 202-637-7000 or TTY 202-638-3780. Bus-to-bus transfers with a SmarTrip® card are valid for free (including round trips) within a two-hour period. Metrobus riders who transfer to the Metrorail system receive a discount of 50¢ if they use a SmarTrip® card. All buses in the Metro fleet are accessible for individuals with disabilities. They have a low floor ramp or are lift-equipped to make it easier to get on and off. The ramps on low floor buses can be manually operated if the hydraulic system fails. Priority seating for the disabled and senior citizens is located in the seats directly behind the bus operator. Two wheelchair securement areas are located near the front of each bus and include tie downs and lap belts for safety. Use BusETA to find the next arriving bus or www.wmata.com/schedules/timetables plan your route and see the bus schedule. WMATA, the Washington Metropolitan Area Transit Authority, is the government agency that provides public transportation within the Washington, DC metropolitan area - Washington Metrorail and Metrobus. WMATA is a tri-jurisdictional government agency that is jointly funded by the District of Columbia, Virginia, and Maryland. WMATA was created in 1967 and authorized by Congress to provide mass transit for the Washington DC area. The transit agency has a board of directors, with twelve members including six voting members and six alternates. Virginia, Maryland, and the District of Columbia each appoint two voting members and two alternate members. The position of board chairman rotates between the three jurisdictions. WMATA has its own police force, the Metro Transit Police Department, which provides a variety of law enforcement and public safety functions. The DC Circulator Bus provides an alternative mode of transportation around some of the most popular areas of Washington DC.